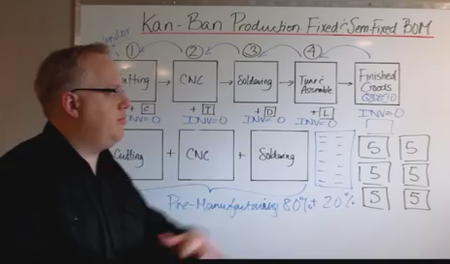 Kanban (看板) (signboard or billboard in Chinese and Japanese) is a scheduling system for lean manufacturing and just-in-time manufacturing (JIT). Taiichi Ohno, an industrial engineer at Toyota, developed kanban to improve manufacturing efficiency. Kanban is one method to achieve JIT. The system takes its name from the cards that track production within a factory. For many in the automotive sector Kanban is known as “Toyota name plate system” and as such some other auto makers won’t use the term Kanban. Kanban became an effective tool to support running a production system as a whole, and an excellent way to promote improvement. Problem areas are highlighted by measuring lead time and cycle time of the full process and process steps. One of the main benefits of kanban is to establish an upper limit to work in process inventory to avoid overcapacity. Other systems with similar effect are for example CONWIP. A systematic study of various configurations of kanban systems, of which CONWIP is an important special case, can be found in Tayur (1993), among other papers. A goal of the kanban system is to limit the buildup of excess inventory at any point in production. Limits on the number of items waiting at supply points are established and then reduced as inefficiencies are identified and removed. Whenever a limit is exceeded, this points to an inefficiency that should be addressed.